Gulf Front home with large private pool. Front of home looking south. LARGE PRIVATE POOL! South-side of home. There are 4 private balconies off the master bedrooms which over amazing unobstructed gulf views. Queen over Queen Built in Bunk. Queen over Queen Bunk Recently added second refrigerator in hall closet. 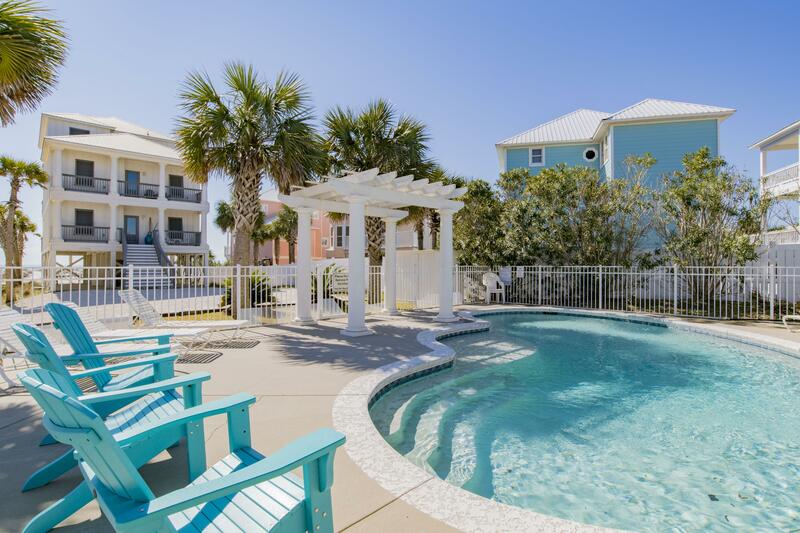 Romar House at Beachside is a beautiful gulf front vacation home that is perfect for multi-family gatherings located in the heart of Orange Beach AL. This home is located in a convenient central location; Hwy. 59 in Gulf Shores is 4 miles to the West of the home, and it is only 2.7 miles from the home to Orange Beach Blvd to the East. This great location is in close proximity to both Gulf Shores and Orange Beach amenities, where shopping, familly entertainment, and restaurants are only a short drive away! This direct gulf front home has incredible gulf front views to the East, South and West. Romar House @ Beachside also features a large custom private pool with lush landscaping. Romar House offers unbeatable views along the gulf coast, due to the fact that this home sits slightly closer to the gulf than the homes to the East and West. This provides unobstructed gulf views to the South, East and West from the den and all 5 covered balconies. Romar House has a total of 8 bedrooms and 7 baths spread over three floors. There are 4 gulf front master bedrooms that all open to private covered balconies facing the gulf. There are a total of 7 covered porches/balconies. There is also ample covered parking under the home, as well as a large parking area in front of the home. The first floor has two bedrooms and two full baths, along with a well appointed kitchen, dining area, and den. The first floor bedrooms feature a king bed in one room and the other room features two twin beds. 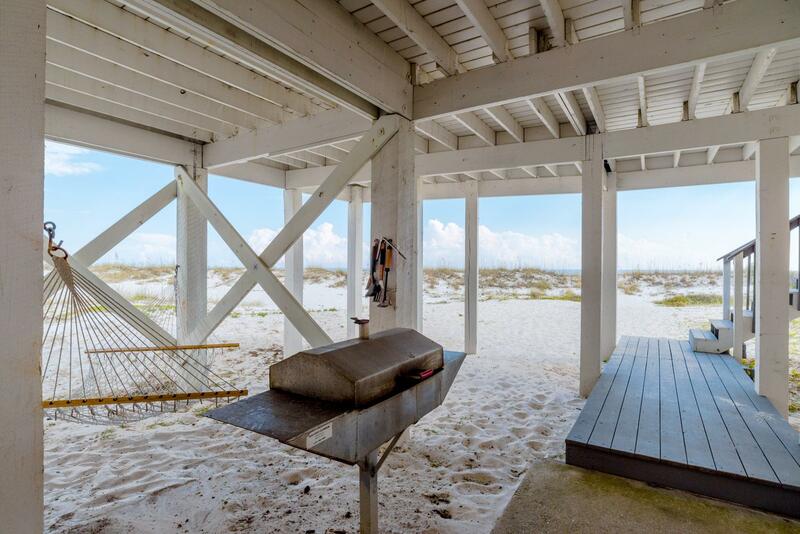 The den and dining area open up to a gulf-side porch that overlooks the gulf. Under the back deck you will find an in ground aluminum charcoal grill, out door shower, two picnic tables, and several hammocks to relax in and enjoy the weather. 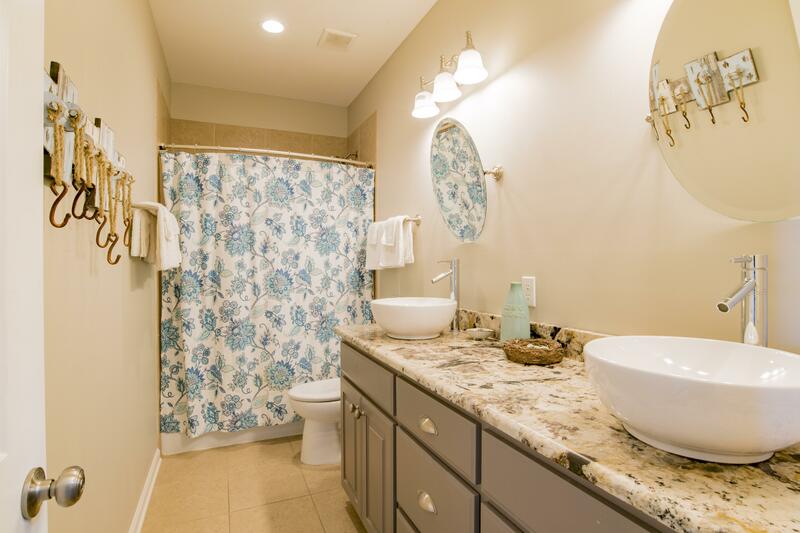 The 2nd floor features 4 bedrooms and 3 full baths. Two rooms are masters with king beds, they both have private baths and private balconies overlooking the gulf. The 3rd room has two sets of bunk beds (sleeps 4) and the 4th room on the 2nd floor features a quenn over quenn bunkbed that sleeps 4. The laundry room is also located on the 2nd floor, with a full sized washer and dryer. The second floor also has a balcony on the north side of the home over looking the private pool area. The 3rd floor has two master bedrooms, each bedroom has a king bed with a private bath. Each of these rooms also have private balconies overlooking the gulf. The west master bedroom on the 3rd floor has a twin bed in the room, in addition to the king bed. Apx SqFt under-roof 5100 sqft. including private covered balconies. This property has 5 King(s), 2 Queen(s), 7 Twin(s). Our family group of 20 people ( 6 months - 74) came for Spring Break. We loved the house and everything about it. I planed this vacation over a year ago and everything was as promised. No problems with manager or the house. We all will cherish our memories we made over the week and will definitely be booking again. Our family recently stayed at this wonderful home in aug of 2018. We have 4 families and three generations all stayed together and never once felt cramped. We loved having the 4 LARGE private balconies off each master bedroom overlooking the beach and the pool was perfect. We were first worried about pool being on north side of the house, but it couldn't have been better! The pool was much larger than the photos appear and very clean. I loved being able to layout on the sundeck built into the side of the pool. The home was clean and tidy upon arrival and we were very pleased with every aspect of our stay. Greg was very prompt to respond to any emails we had and was great to work with. We also loved the location of this home, it was basically within 5 minutes of everything in orange beach and gulf shores. We also explored the Back Country Bike trail. It starts about a mile from the house. The beach behind the house was private and the beaches were beautiful! We highly recommend romar house and will def plan of staying here again next time we vacation in orange beach along the gulf coast. Many great memories made with family and we were all thankful to be together. Our vacation was excellent, thank you for reaching out. We have been renting a house each summer all over the east coast since 2008 and the consensus was that this was the best house yet and the best vacation yet. We would definitely recommend it. The place was very clean, well stocked, very accommodating and a perfect location. Thank you. Just a quick note to say thank you to you and your wife for allowing us to stay in your Romar at the Beach home this past week. Our family had another wonderful vacation together and we hope to repeat it in the future. The home was as lovely as it was two years ago when we stayed. It was great, Greg! We loved being at your house...the beach as our front yard is hard to beat! Thanks for sharing. Just got home tonight...lots of memories made! It was perfect for our work retreat – we wanted to all be close enough to bond, but we all needed our own space to retreat to. This is an annual event for us, and everyone is already asking if we can stay there again next year. I may go ahead and reserve soon. Everything was clean and in order when we arrived. Plenty of room. Right on the beach. Close to great restaurants and markets. My only suggestion would be to add a hot tub. Very well stocked kitchen and we appreciated the beach chairs. Beds were very comfortable and loved the front deck for sunning! Easy rental process and all was as promised! We recently visted Romar House at and all had a wonderful visit. The views from all the back decks are amazing! The sunrise, sunset and everything in between was perfect! 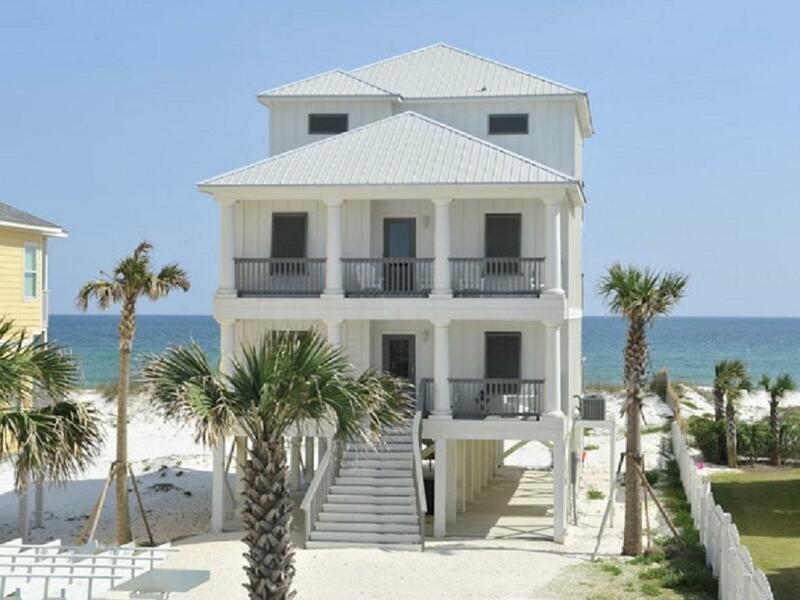 We also loved the location of this home, we have been to gulf shores before, but we really enjoyed orange beach. 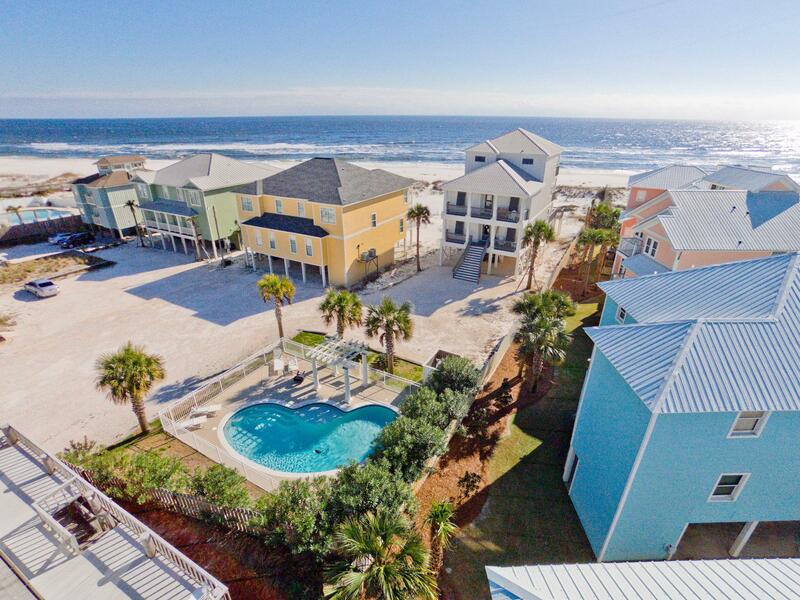 This home is only a short drive to gulf shores and anything in orange beach. Hope to be back to orange beach AL soon!! Next time we plan on bringing our bikes also, there is a bike trail that's starts about a mile from the home and runs all through orange beach and gulf shores. Thanks again for a great trip and hope to start making romar house our annual house we stay at for the family vacation!! Great setup for large families and groups, nicely decorated , and perfect for creating special memories with loved ones. We also loved having all the private balconies off the 4 master bedrooms. Our family of 17 (yes 17 of us from ages 3 to 65) had a wonderful vacation together at the Romar House @ Beachside. The home is tastefully decorated, there was plenty of room for all to enjoy and the convenience to the beach, activities and restaurants can't be beat. The owner is very accommodating and responsive to questions and requests. We have so many special memories and our kids and grandkids have all decided that we HAVE to come back! The amenities in the house were great such as the large sun deck (plenty of room for all of us to use together), the ice machine was a plus, the private pool was beautiful, and the beach toys and equipment very convenient to have and to use. Having so many private balconies provided plenty of space for everyone to have some private time as well. Our family is still laughing and sharing stories of the good times we had there. We highly recommend this house for large groups and families. 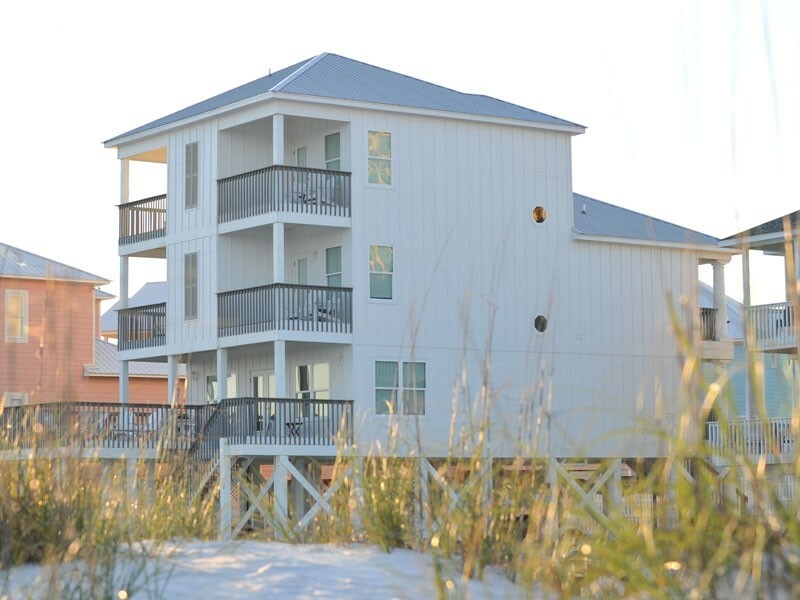 We definitely plan on returning to this best of the best oceanfront home in Orange Beach. was comfortable and it felt exactly like home, but even better. I would 10/10 recommend going back to this house and staying even longer than we did this time! Hopefully we luck out next year with getting this chance to stay in this BEAUTIFUL and convient beach house next year! Great view of the gulf. Loved looking down the beach from the private balconies! Location is very convenient to many restaurants, shopping, grocery stores, etc. in Orange Beach. Spacious rooms, and well stocked kitchen. Loved the huge open deck; it provided plenty of room for all the girls in the group to sun tan. We so enjoyed being next to the gulf, as well as having a private pool to enjoy with our family. I would recommend this home to another family member or friend, we had a great time!! We celebrated our 50th anniversary by renting the Romar House last year. It was beautifully done and decorated. It accommodated our large family quite well. The 13 grandchildren spent many hours playing in the sand and watching the dolphins. The most memorable evening was having a baby dedication for our youngest granddaughter while we were all together. A very special time. The kids found a Zip Line and a go kart track not far from the house and enjoyed that. Greg was very helpful during and after our stay. We would recommend it to anyone looking for a place to relax and have fun with those they love! Me & 15 girlfriends (ages 50-62) came here for a getaway & had a wonderful, relaxing time! There was a bed for everyone-kitchen well stocked & Greg even had chairs & umbrella for guests to use on the beach. The house was beautifully decorated & so calming. Couldn't have asked for a better place-the view was perfect, perfectly located -convenient to restaurants, shopping, etc. When you walk through the door the very 1st time there's an immediate calm that takes over & you know you are at the perfect place! Would definitely recommend this property. Greg was super to work with & any questions were answered immediately. Our entire family recently traveled to Orange Beach and visited the Romar House @ BEachside. We had one of the most enjoyable times all being together and absolutely loved the setup and location of this home! 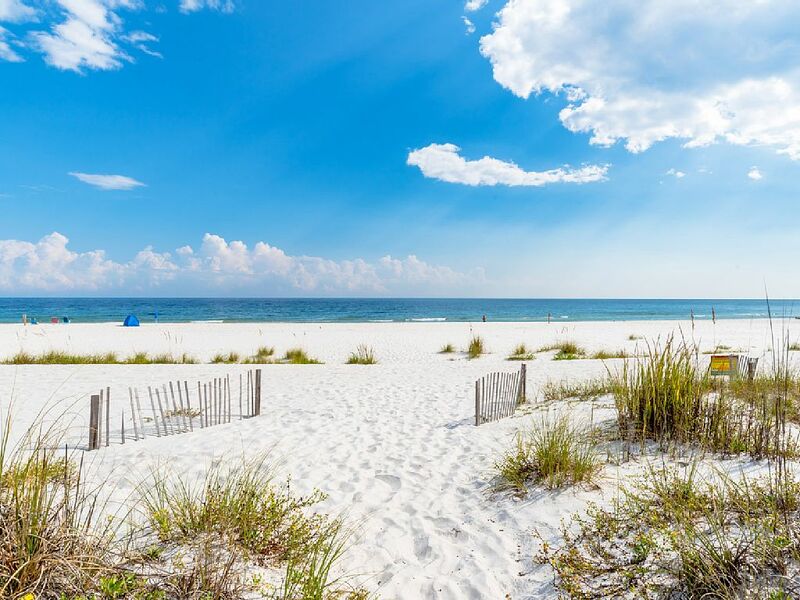 It is tucked way back off Perdido Baach Blvd and has great privacy from the busy highway, and offers the best views of the beach we have ever experienced while visiting the area. We loved having our private balconies and could see for miles in all directions!! We could see over the neighbors houses to the east and west and were closer to the beach than the houses beside us, which really enhanced our views even more. Everything about the house was clean and very well maintained and the listing accurately displays everything. The photos actually make the parking area look smaller than it truly is. There is an ample amount of space between the pool and house, you can also park several cars under the home. This home has everything one could desire in a family beach trip. The location is perfect, its located in the most desirable area in Orange Beach and is only minutes to down town Gulf Shores. We would highly recommend this home to anyone looking for a great family get away, at a very nice property, located in an incredible location. I have been wanting to write a review since we stayed at the romar house last May since I totally rely on what people write on their reviews and let me tell you that we all LOVED staying there. Greg was great with texting me back immediately with all my questions and phone calls! We had 7 adults and 6 kids ranging in age from 7 months to 11 years .The house was just as beautiful as the photos. We had plenty of space to spread out. The beach was perfect and the pool was clean and such a plus for that home. All of us gave it 5 stars and would highly recommend it to all who reads this review. We also loved the ice maker in the kitchen that was seperate from the fridge, and had plenty of seating area's in the kitchen. The location was uncrowded and close to grocery stores, and activities, and restaurants. After driving around and exploring we all said we liked the orange beach area the best and were extremely happy we chose that home to make such great memories for our family! From the mouths of every single person in our group (ages 4-60) "This is the best vacation ever" and "this is the best house" of all. I am the renter of all our vacation properties and have very discriminating taste and standards. It's always a concern if pics are current, if the property is clean, safe and up to date--Romar House at Beachside gets a resounding YES to all those questions. 1000% accuracy in the description and photos and the owner is actively involved with his rentals-he inspects them between arrivals - there is nothing better than owner involvement - from reservation through vacation completion, Greg was accessible, engaged and a pleasure to work with. The home itself is special, well appointed and spacious. The decks are amazing. If you are lucky enough to get the amazing weather we had (80's during peak of day and 60's at night) the A/C can be turned off and the deck doors opened-what a feeling of heaven to get cross breeze from the ocean throughout the house. The private decks off the master suites and then the larger deck for all to gather are simply marvelous-private time and family time, however, one likes it. The private beachfront was a fan favorite! We put a tent up on day one and left it until the night before depature-no worries. Leave all your chairs, pool & beach toys at home-the house provides ample & quality items. You will not want for anything. 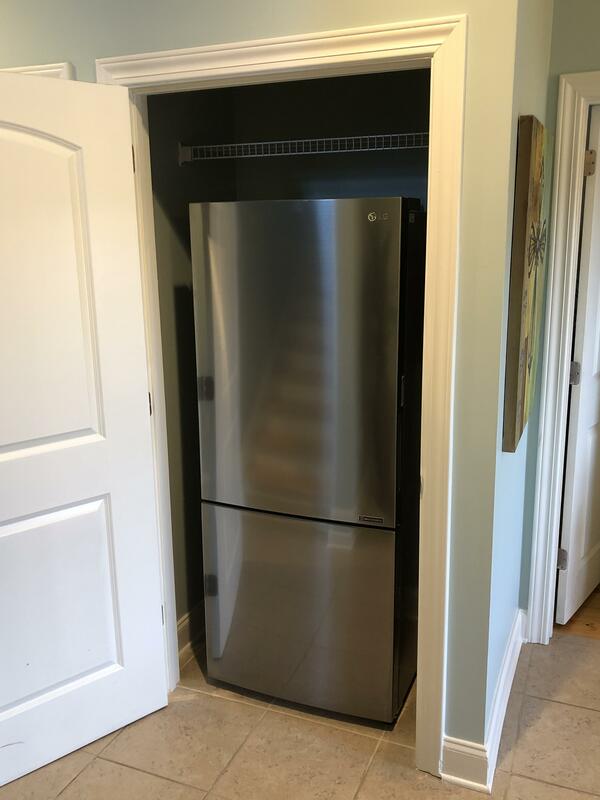 The ice machine, Greg, what a cost saver and a nice addition. Something that might seem small to some was a huge asset for us; we saved a mini fortune on buying ice for coolers for days @ beach & other outings.The welcome gift was a special addition-never had anyone do that before. God provided the beauty of the ocean, beach and perfect weather and Greg provided the little slice of heaven to make family memories. Our future rentals will be from Greg. For everyone else, rent this property, you will not be disappointed. I travelled from London to meet my daughter and 3 of her friends on Spring Break from Baylor University. We spent the week here and loved this house! The view and the private beach have set a new standard for beach rentals for me. I loved the decor and the 5 master bedrooms with ensuite bathrooms were a great fit for us. We still had a lot of room for others to sleep had we needed it. I will definitely rent this house again when I am in the area! Our family gathered here for the perfect Christmas celebration. we came from Alabama, Florida, Tennessee, Texas and Arkansas.......... 14 in all......... and we had a great time. This is one of the best places we have ever stayed..... It was big enough for all of us to spread out and small enough to have together time. I loved that it was right on the beach. The pool is an added feature to this house, but of course it was too cold for us to enjoy it in December. The furnishings are so up to date and beautiful and I especially liked the fact that someone has added so many extra's. I loved having our own devotion books at each bedside.... Nothing was lacking...... Thanks for sharing your beautiful home. Entire family of adults and teenagers spent 7 days at Romar House Beachside. Beach was great and uncrowded and house had everything we needed. Great place, well equipped kitchen and very conveniently located./ Advise buy any liquor before entering Alabama. State tax is very steep. Grocery stores are very close, so no need to take groceries,etc. The Shrimp Basket was the only restaurant visited. Good food at a reasonable price. I would recomment Romar House Beachside and Orange Beach to anyone.! This was absolutely the best rental where I have ever stayed! We were able to totally relax and enjoy our vacation due to all of the comfortable furnishings. All of the bedrooms had beautiful views from their individual balconies and provided plenty of privacy as well as tremendous comfort! This was perfect for our crowd. The private pool is awsome! I would recommend this to any family who wants to enjoy their beach trip. There was plenty of room for everyone. I am booking this one again! If you have doubts about this house for your vacation.....stop it is absolutely PERFECT!!! The house was clean and well maintained. The listing is accurate right down to the pictures and the pool was amazing. We had five families including 7 children ranging from 1 to 12 years old and each one of them enjoyed the beach and the pool. I would recommend a baby gate in order to keep the small children off the stairs. Make sure to visit the Steamer (restaurant) for great food. Thanks for a great family vacation filled with many memories to last a lifetime! "Best of times " and "Best vacation ever" , were the comments posted by my girls as they sent their pictures home ! My babies ran constantly between the beach and the house stopping only to play in the cool place under the house . I must say those hammocks were wonderful with the cool breeze in that favorite place. The house was exactly as advertised , and we could not have been more pleased. Long ago , a friend told me to always rent a vacation place better than what I have at home. This property leaves nothing to be desired ! Close to my heart was staying in a Christian home - from the hospitality gift and throughout the house spoke tons about the property owners. I came away knowing that we had started another of my family traditions. Working with Greg Crews was an absolute joy . Thank you for sharing Romar Beach House !! We had five couples and six children and still had room to spare. Kitchen was great! Has an ice makers. Would highly recommend this house for large groups. It is three floors so be prepared to climb stairs. Everything was clean and nicely decorated. We had a group of 6 couples for the week and celebrated birthdays, anniversaries and a retirement! Couldn't have asked for a better place to celebrate. Other than a couple of minor issues that were quickly resolved, the house was perfect. Lots of options for sleeping arrangements and plenty of space for all. Location was central to Gulf Shores, Pensacola, and Mobile. Greg was very accommodating and answered any and all questions we had prior to arrival. Would highly recommend Romar House! There were two families who got together for a small intimate beach wedding for my sister. We had the best of both worlds; the beach and our own private pool. What an amazing week. The house was very well stocked...even had nice beach chairs for our use. The house had enough beds for everyone and enough space for the adults/kids to enjoy their own time. Anytime I had a question Greg was very prompt with his response. The location is great. I would highly recommend to any family who wants a great get-together!!! This home was beautiful, well stocked with kitchen essentials and bath towels, and conveniently located, close to the beach (on the beach) and close to shopping/restaurants/night life. The house was easily able to accommodate a group of 14 girls for a weekend getaway. The home's listing and pictures were accurate. I would highly recommend this home to any large group.